This is the L16. A one of a kind device that its manufacturer calls the camera of the future. But at this point it's such a work in progress that it feels much more like a prototype from the past. I'm Mr. Mobile and these are the peaks and the pitfalls of the pricey Light L16. (electronic music) A big touch screen, an Android operating system, a symmetrical rectangular chassis. The L16 might look like a smart phone in pictures, but pick it up in person and you'll see that it's a much more substantial slab than the biggest of Samsungs. That makes sense because it's not really meant to do battle with the smart phones of the world. It's aimed at professional photographers instead who are more likely to edit their images on a computer in Lightroom than Instagram them from a phone. The hand feel reflects that. At 435 grams this thing demands two hands, which will find their places easily on the casing's textured rubber grips. Compared to a Micro Four Thirds camera, like this GH4, the L16 is actually pretty petite and it eliminates almost all the buttons, knobs and switches in favor of that tapable, five inch display. Thankfully a physical shutter button stays put with good springy action and a nice firm half-press to focus to tent. Below that is a small touch panel that looks ready to do some thumb zooming, but as of press time it wasn't yet activated in the device's software. Also awaiting future activation is the proprietary accessory port on the bottom and its neighboring three and a half millimeter headphone jack. Well actually the headphone jack is active, but there's very little to listen to at this point since you can't yet record video on the L16. That's a feature coming down the road. 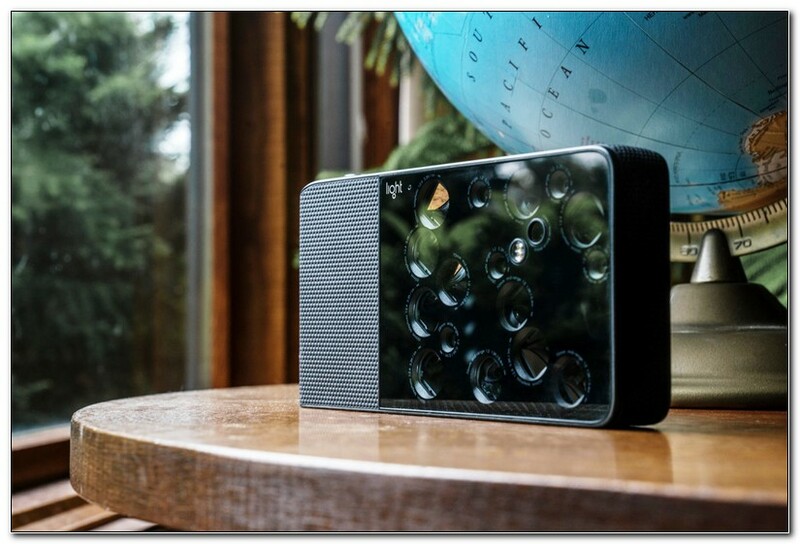 Those gaps contribute to the feeling that this is a prototype, which makes sense because Light seems more interested in licensing its camera technology to other companies than just selling L16s. And that technology is definitely the most interesting thing about this device. The camera's used different focal lengths from 28 up to 150 millimeters and they're also assigned different exposure values per photo. Manipulating this when shooting is about as easy as with a smart phone. You pinch to zoom, tap to focus or if you want to switch to manual mode, you get sliders that are pretty easy to figure out. When you snap the shot, 10 of the sensors fire at once. With the software stitching the overlapping 13 megapixel images into a single large canvas. The file size varies but most of mine have weighed in between 51 and 81 megapixels. A far cry from your smart phone's typical 12 megapixels. They're saved in a special format, which lets you manipulate them using the Lumen Desktop software so you can do things like change focus and apply depth effects after the fact. The promise of this technology is what convinced me to buy this review device. Light says the L16 should capture photos with exceptional dynamic range and it should feature excellent low light performance as well. I don't have the expertise or the equipment to test that claim as well as I'd like, so I took a walk down the road to my good friends at Reviewed.com here in Cambridge Mass who were good enough to point the L16 at their equipment for a quick testing session. The Imatest results were promising. Reviewed said the L16 does a good job of "preserving shadow detail and limiting noise in the lab environment which is a key limiting factor that typically reduces the dynamic range in smart phone photos". I was encouraged by that finding, and when my L16 got a software update that added local tone mapping I was even more hopeful. But sadly my results out in the real world have been almost universally disappointing. In a vacuum some of the L16s photos have been passable, but shooting alongside a Pixel 2XL, there hasn't been a single instance where I preferred the L16s picture. I understand this camera wasn't made to go toe to toe with the smart phone and I'm also very aware that the Pixel 2 has one of the best phone cameras on the market, but given the L16's pedigree and Light's big promises compared to DSLRs, I expected much better performance than this. And the unfinished nature of the software means there's no quick way to get photos off the unit without connecting it to a computer. I've read that there's a way to do this through the built-in browser, but that browser has terms of service and a privacy notice that don't load so no thanks. If you're a pro-photographer who's used to plugging into a computer and using desktop software to get the most out of your pictures, than the L16 and its Lumen program will probably feel quite familiar. There are some useful tools built in including edge clean up capability to correct portrait shots. That's great but it's there to correct for yet another disappointment. The L16 is substantially worse than some smart phones at applying the depth effects that you expect from a portrait. So you've got mediocre image quality in a package that barely fits in a pocket, no video capability yet and no native wireless sharing from the device to third party aps yet. At this point the only things I still like about the L16 are its daytime landscape photos. Oh and its tripod mount. Now Light is constantly releasing updates and seems very invested in its community of L16 owners, so maybe we can expect encouraging developments down the line as we saw with the initially disappointing and now acceptable Essential Phone thanks in no small part to a price cut. If you're an experimental photographer who's just in it for the tech, there's certainly plenty of potential to drool over here. And I'm sure we will see this technology or at least the lessons from it bleed over into cameras and other devices in the coming years. But as for the L16 itself, well for 2000 bucks I can't recommend it to anyone at this point. But I do recommend you visit Thrifter.com. I try to keep my sponsor offers relevant to the video at hand where I can and Thrifter has sniffed out a great deal on a Canon T6i with lens for 500 bucks. Thrifter is a new way to say money by shopping based on value and not hype. Hit the link in the description for that Canon deal or for savings on everything from gadgets to homegoods at Thrifter.com. 0 Response to "Light L16 Review: Optical Insanity"